i just got this servo for my 8ight e, and i love it, it is a little noisy, but that isn't a big deal at all, it is the fastest servo ive ever seen, get this servo, it is perfect for 1/8 buggies and 1/10 truggies! I bought this servo for my 1/10 4x4 SCT, and all I can say is WOW... This servo, by far, is the best overall in the $50-80 price range. If you don't use a cap/glitch buster/external BEC you will have glitching on a Castle MMP. I use castle's ext. BEC with my MMP and have had no problems with it set at 6 amps. This servo is fast and very smooth. It’s a little on the louder side when not sitting perfectly still, but you can’t hear it at all when you’re outside. The orange looks cool, and it gives whatever car you’re using a nice touch of color. If you’re a competitive racer, you really don’t need any faster than .08. This is one of their best servos, definitely 5 Stars. It really is great, get it and you won’t regret it. I love these servos. I have 3 of them now. I run them in my TLR 22SCT and 22T. I just put one in my Tekno SCT410 and it worked great too. These things are fast and strong. I use to use Hitec but I do not plan on buying anymore Hitec's anytime soon. I bought this servo for my 2wd buggy. The speed of this thing is perfect for a 2wd buggy. It has lasted well over a year now with no problems. The price is very good as well and much less than the other big names like futaba, airtronics and ace r/c. Attention! the servo is extremly good. i have got 4x4 slash and mmm 2650kv combo also. but this servo doesnt compaitable with mamba escs. if you still want this set in your car, you should get a bec cap or cc bec. I run twice 1256 and 1258 on a Life battery and a set of Savox high voltage servos on a 8ight 3.0 buggy with a lipo. After finishing 2nd qualifiers with an Xray, it started being jolty and smoky (on the box). Saw the obvious problem, switched the power off and that was it . . . 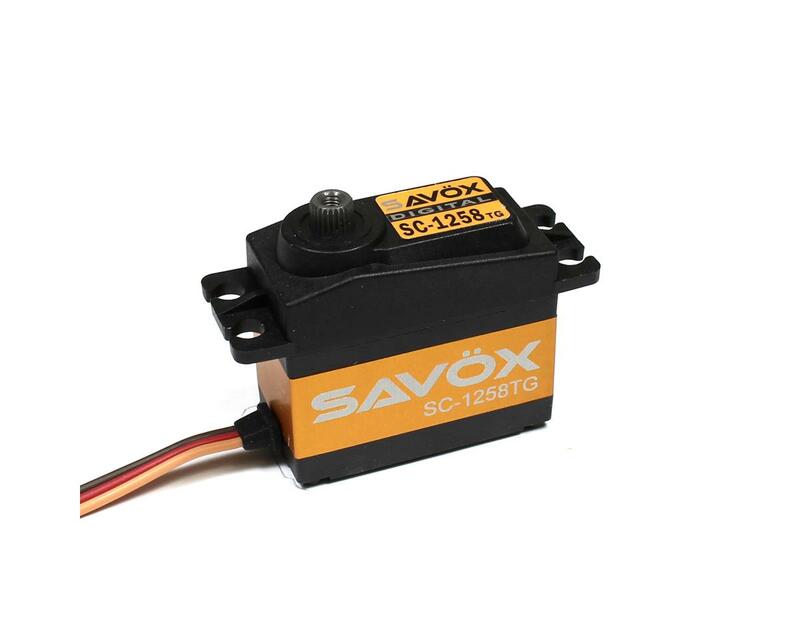 This is the 1st Savox servo that failed (SC-1258TG) in my knowledge lol. Hmmm after replacing it with the same PN spare, opened the faulty one up. It sucked humidity / water from underneath. It is DEAD. But it served me right for more than 3 years. Kept the titanium gear. 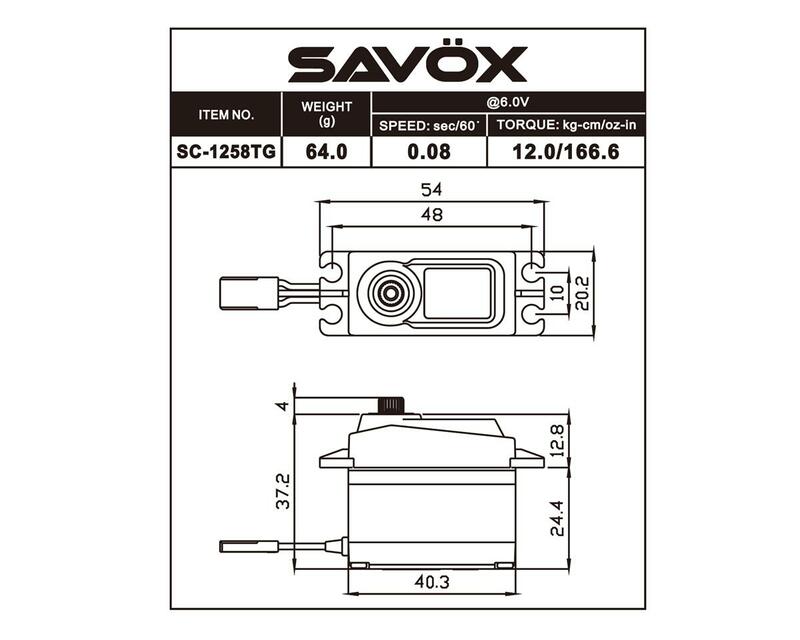 Savox servo's means quality. No doubt. Over 2 years in service steering my Durango 408 with out a problem, works good. Great servo for the price. I will note that when using a lrp spin super esc I needed to add a glitch buster to my receiver other wise the rear tires would spin when turning my wheels even though I was not giving the transmitter any forward or reverse input. I will also say that I am new to building rc kits so it took me some research to figure out this problem. I thought I got a bad esc so I ordered a reedy blackbox 800z esc/ motor combo and that worked fine with this servo and did not need to use a glitch buster with this setup. I bought this for my Losi 22 Buggy. It's night and day between this and the stock high torque servo I was running. A fast servo is a must have for competitive racers. Savox is pricey but it works. I have another Savox servo that I ran in my Slash 2wd and now in my Losi SCT. After a lot of abuse it still runs like new. I have this servo in my yokomo drift car and i love it. First rc car ive built from scratch piecing together components like these and loved the features and bought it. Everyone comments on how fast it is. Its precise and i love the Ti gears and alumuminium casing. Bought it over a year ago and still no problems. I LOVE IT. And i would buy SAVOX again. Great servo!!! Very, very fast!!! Great price!!! Ideal servo for all SC's Truck's!!! I’ve used this servo in my different projects. Works flawlessly. I’m a savox fan. All my replaced Servo are savox. Besides buzzing they work great. I am use to running higher end servos in the past. These days I am fielding a 3 person race team for both off road and dirt oval as well as all our other land based rc addictions. Lets just say it is not in the budget for all of us to be running 140 buck servos in all our vehicles. So I took a chance and bought 2 of these servos. While yes they are a little noisy they are one of the nicest servos I have ever seen in this price range. Great servo, using in my B6D and am going to use in my B64D. Super fast, super strong, nothing bad has happened, super high quality, and looks amazing. Have this servo in my SCT22 and RC10 T4 - incredible response and speed. When I first hooked it up I laughed pretty hard because of how quick this servo is! Has also been through heck and back with zero issues. I will always run this servo in my trucks until Savox makes something that tops it. I would recommend upgrading the receiver if you have a lower end/ RTR one because this servo requires a lot of power that some receivers cannot feed - did have intermittent response issues until I upgraded to my T4PLS system. speed on this servo is great, very smooth too. find it a bit noisy though. i use it as streering servo for my savage ss truck. great product!